To compare dynamic contrast-enhanced MRI (DCE-MRI) data obtained using different prebolus T1 values in glioma grading and molecular profiling. We retrospectively reviewed 83 cases of gliomas: 46 lower-grade gliomas (LGG; grades II and III) and 37 high-grade gliomas (HGG; grade IV). DCE-MRI maps of plasma volume fraction (Vp), extravascular-extracellular volume fraction (Ve), and tracer transfer constant from plasma to tissue (Ktrans) were obtained using a fixed T1 value of 1400 ms and a measured T1 obtained with variable flip angle (VFA). Tumour segmentations were performed and first-order histogram parameters were extracted from volumes of interest (VOIs) after co-registration with the perfusion maps. The two methods were compared using Wilcoxon matched-pairs signed-rank test and Bland-Altman analysis. Diagnostic accuracy was obtained and compared using ROC curve analysis and DeLong’s test. Perfusion parameters obtained with the fixed T1 value were significantly higher than those obtained with the VFA. As regards diagnostic accuracy, there were no significant differences between the two methods both for glioma grading and molecular classification, except for few parameters of both methods. DCE-MRI data obtained with different prebolus T1 are not comparable and the definition of a prebolus T1 by T1 mapping is not mandatory since it does not improve the diagnostic accuracy of DCE-MRI. • DCE-MRI data obtained with different prebolus T1 are significantly different, thus not comparable. • The definition of a prebolus T1 by T1 mapping is not mandatory since it does not improve the diagnostic accuracy of DCE-MRI for glioma grading. 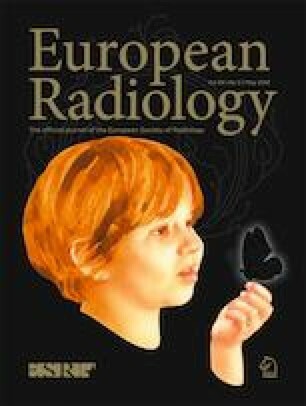 • The use of a fixed T1 value represents a valid alternative to T1 mapping for DCE-MRI analysis. A. Falini and N. Anzalone contributed equally to this work. The online version of this article ( https://doi.org/10.1007/s00330-019-06122-x) contains supplementary material, which is available to authorized users. The authors thank Marcello Cadioli and Antonella Iadanza for technical support, and Bradley J. Erickson for reviewing the article. The scientific guarantor of this publication is Nicoletta Anzalone. The authors of this manuscript declare relationships with the following companies: Nicoletta Anzalone is a member of the advisory board of Bracco; is a consultant for Bayer Healthcare; is on the speakers bureaus of Bayer Healthcare and Guerbet. All study subjects have been previously reported in: Anzalone N, Castellano A, Cadioli M, Conte GM, et al. Brain Gliomas: Multicenter Standardized Assessment of Dynamic Contrast-enhanced and Dynamic Susceptibility Contrast MR Images. Radiology, 2018.